for $2,398,000 with 3 bedrooms and 2 full baths. This 2,014 square foot home was built in 1941 on a lot size of 0.0574 Acre(s). 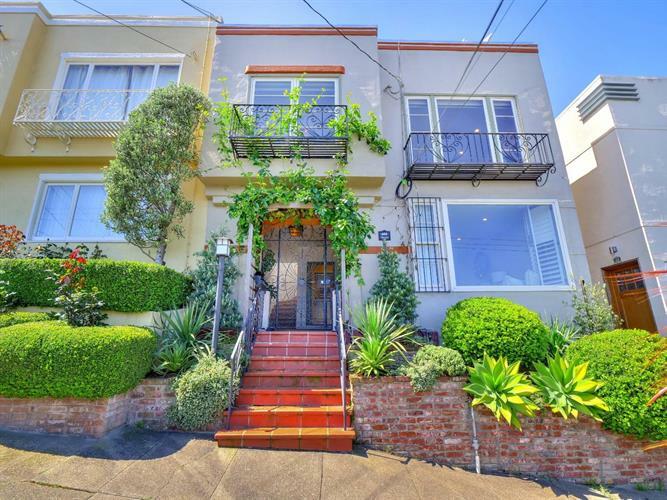 This fabulous 3 bedroom, 2 bathroom home is located in an affluent and family-friend neighborhood on the boundaries of Noe Valley, Eureka Valley, and The Castro. With spectacular views of downtown San Francisco, this home has so much to offer its new owners. A tasteful entry-way leads to the front door and opens to a completely remodeled living room, dining room, and gourmet kitchen with high-end appliances, dual ovens, wine fridge, and quartz countertops. The lower level features two bedrooms, including the master, which boasts California closets and built-in cabinetry. The upper level features two spacious bedrooms, one of which opens up to a sun-drenched outdoor patio. A large 2-car garage with side-by-side parking also has extra room for storage. County records show 1, 650 sqft, however, permits and appraiser note 2, 014 sqft. Don't miss out on this fantastic property that is closet to public transportation, tech shuttles, restaurants, playgrounds, and dog parks.